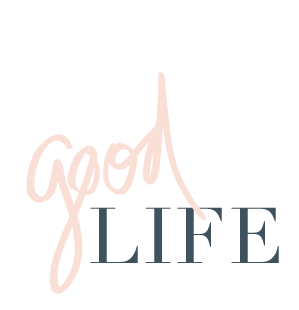 jillgg's good life (for less) | a west michigan style blog: my home: how to set up gallery wall ledges! 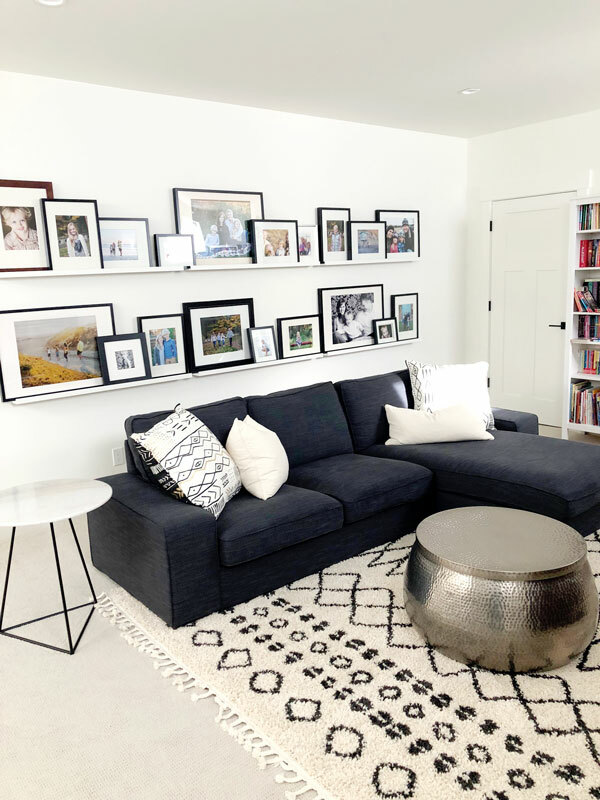 my home: how to set up gallery wall ledges! 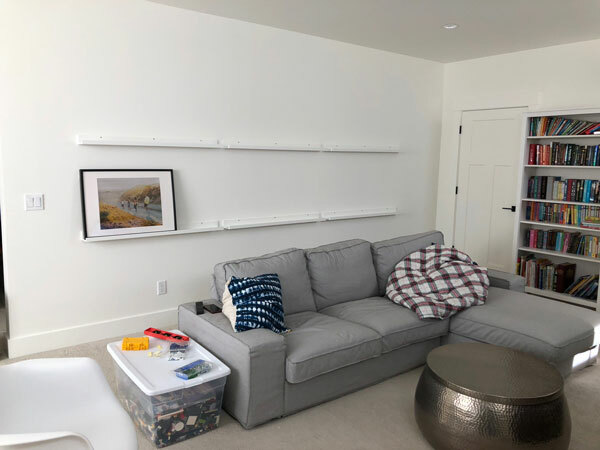 In our previous home we always got so many questions about our gallery wall ledges - both in person and from the family room tour. 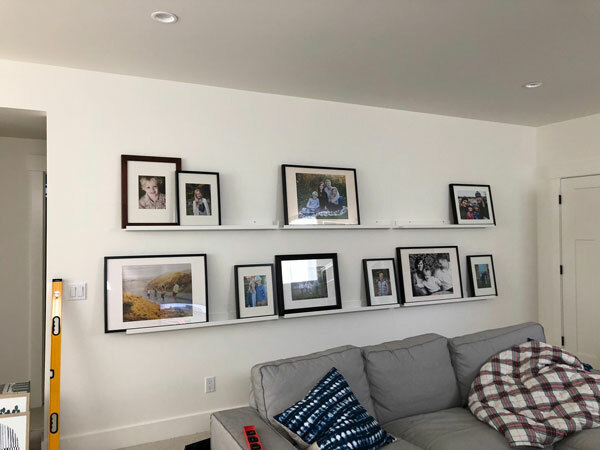 You can see how we did them in our previous home here having them flank the fireplace was a great way to fill a lot of wall space. In our new home we decided to set them up in our family room again but the set up is very different here. With one HUGE blank wall to fill we knew it would be the perfect spot for our gallery wall with photo ledges. If you rewind WAY back we had an awesome gallery wall in our old, old home - which you can find in the archives here, which was more of "classic" gallery wall with all the photos hung directly on the wall. I love this look but it's A LOT of work. 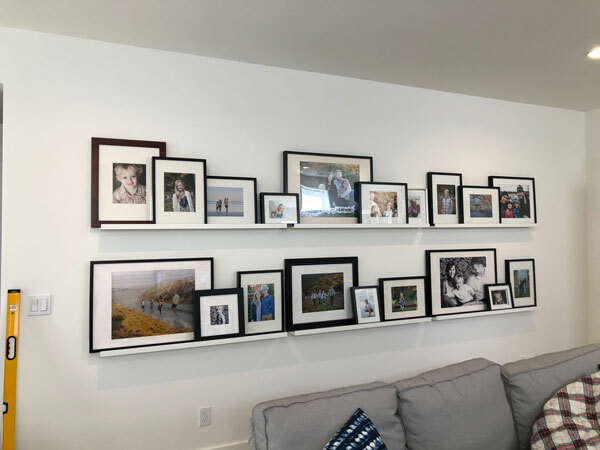 The awesome thing about a gallery wall with photo ledges is that it's easy to mix up the frames, swap out photos or just easily 'mess around with it' whenever the mood strikes! Okay let's get to the step by step process I used to pull together a balanced and cohesive look to the gallery wall with photo ledges. Step 2 (below): Hang all the large prints first. I like to have a mix of large, medium and small frames. To get started (with any gallery wall) I always hang the biggest pieces first. You can see here I balanced out the width of the wall with the three large photos spaces almost equally apart. Make sure to keep it creative too... it doesn't have to be perfect! Step 3 (below): Place medium sized photo frames next. Next you will want to fill in with the medium sized photo frames next. Again I like to make it somewhat symmetrical but also make sure it's not too perfect to give it a more natural look. 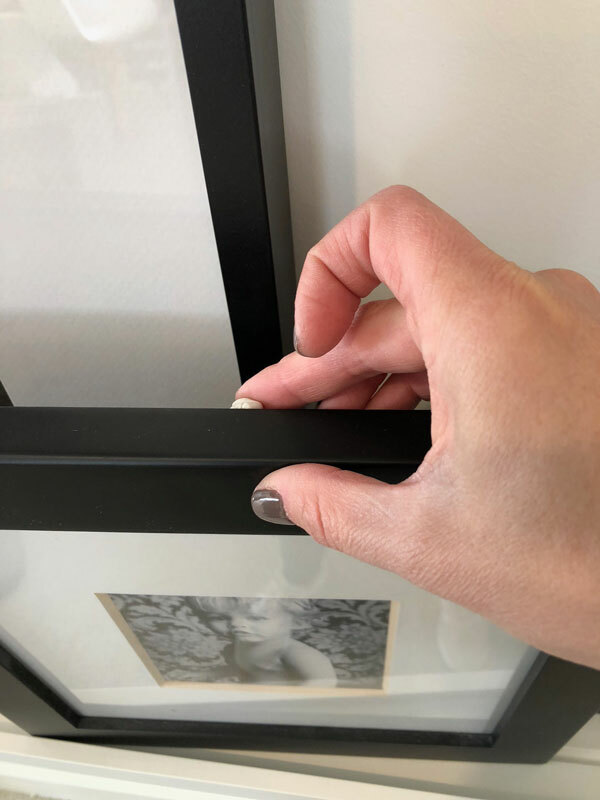 Along the way (below) to make sure the photo frames are staying secure on the ledge I use this sticky putty to keep them from moving. It's not ultra secure but it's enough to keep it in place if it gets accidentally bumped. I find my putty here. Step 4 (below): Fill in the blanks with smaller frames. Then to finish the look off I fill in the spaces with the smaller frames - again making sure to contrast heights and widths to keep the look interesting. And then - voila! This is SUCH an easy project. 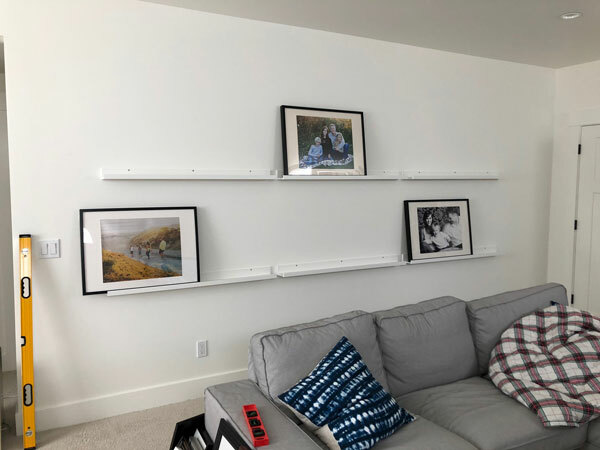 Total time was probably 30 minutes for my husband to hang the ledges and 30 minutes for me to set up the photos. But as you can see it's one that makes a BIG difference and it's a great way to give a lot of personality to any room! Below is the finished product! Our family room is FINALLY starting to come together after a few months of scratching our head about what we wanted the vibe to be down there and how we wanted to decorate. It's a cozy and family friendly spot for watching movies or football and we love hanging in this room! Large Drum Coffee Table, World Market (we keep all our board games in here... it's huge! Spring Old Navy Try on session! what I'm packing for spring break! 3 spring outfits that aren't shorts (or jeans)! site design by kiki co.